Come Taste the Band (CTTB) is a Norwegian classic hard rock band, founded in 1997 by guitarist Jo Henning Kaasin and singer Vidar Heldal. The early line-up, included bass player Ståle Naas, Eldar Melkvik on keyboards and Frode Flatland on drums. In the early years, CTTB was a Deep Purple tribute band and released two CD`s with Deep Purple songs; "A Tribute To Deep Purple" in 1999 and "Live" in 2006. From 1997 to 2007, CTTB played hundreds of concerts in Scandinavia. In 2011, Come Taste the Band teamed up with former Deep Purple/Rainbow-singer, Joe Lynn Turner. JLT & CTTB toured Scandinavia, doing both Rainbow and Deep Purple material. Together they hit the road between 2012 to 2014. During days of, Turner, guitarist Jo Henning Kaasin and bassplayer Ståle Naas wrote and started recording two brand new songs, Tied Down and Don`t Let Me Bleed. 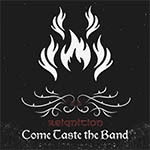 Both songs ended up on the new CTTB album, "REIGNITION". The album "REIGNITION" includes 9 classic hard rock tracks, played mostly live in the studio and with lots of improvisations. Doogie White is singin on 7 tracks and Joe Lynn Turner on 2 tracks.